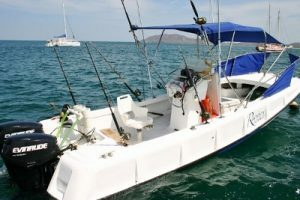 This 22ft Boston Whaler powered by twin 65HP outboards is one of the premier small boats in Tamarindo. The very experienced and highly respected Captain Gerald Ruiz, considered the area’s top Roosterfish captain/guide, is at the helm. She features a shaded deck with Bimini top, coolers, all-IGFA tackle, radios, depth sounders and a complete range of safety and emergency gear.